For those who respect the power that they have when they care for kids. With a pupil in the middle of your eye. “Institutional teaching and learning places enormous power in the hands of each teacher. Each shares with parents, for an important period of time, the development of the lives of growing human beings who are going to take over this world from us. Do we ever reflect on this enormous power of the teacher and whether we principals are allowing them to use their special expertise for the benefit of their pupils. Suppose we, as sincere teachers, are able to give some of our thinking time to the consequences of our actions in the classroom. We do this at times, don’t we? A teaching nun once told me of a pupil who told her, to “Get f…..!” My instinctive reaction would be to flatten him [I’m a product of the sit–stillery, exam-ridden schools of the 40s]. “Nobody loves me.” said Danny. Wisely, it seemed to me at the time, the conversation with Danny did not go much further than this. Actually, the teaching sister was searching for ideas on how to show Danny that her love was genuine – without over-doing it. She was hoping that the next encounter would assure Danny that he belonged in a circle of learners who shared his teacher’s love and that things would go better in a non-disruptive interchange with his [future] friends, sharing learning challenges with mutual affection for achievement. As a former Queensland classroom teacher/teaching principal for many years [and so proud of it], my heart really bleeds for present day teachers of Years 3,5,7,9 who must try to establish enjoyable, challenging learning environments while they are also expected by school authorities to scare the living daylights our of kids to get higher scores with meant-to-be-confusing, standardised multiple-choice questions that are just so pathetic and meaningless to the Dannys of this world. The Dannys have plenty of more important things to worry about. They need genuine schooling to experience the great joy of learning and genuine teacher-love. They can certainly do without the soul-destroying testucating stupidities forced on them by present day Australian governments. The task of the humble classroom teacher of 2014 is infinitely more difficult than my colleagues and I had to tolerate. 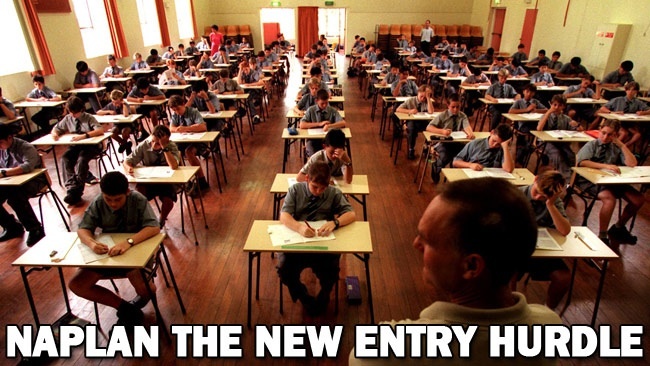 We certainly taught towards nasty end-of-school-exams, but it was, by no means as professionally debilitating and soul-destroying as NAPLAN is. Our superordinates were demanding, but they knew what was going on. They had ‘been-there-done-that’ themselves and understood the classroom milieu and the kinds of classroom interactions that are productive in learning terms; so could help with the teaching processes…such as they were. And so we changed and improved our techniques. Products of the managerial era, today’s dominating, testucating superordinates would just not have a clue. NAPLAN’s focus on fear and practice has much greater intensity than did end-of-year tests of old; while there is a much greater need, these days, to take special notice of the Dannys’ of this world whose social future is not bright. There are so many Dannys now. [Of the 42 infants at a pre-school in my neighbouring suburb, 40 are from dysfunctional homes.] 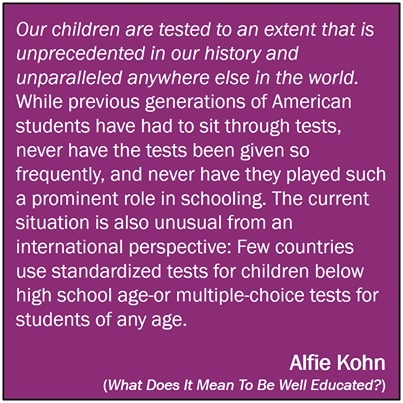 Yet, all that our teachers’ superiors and the profiteers care more about NAPLAN testing. The feelings of kids don’t matter. The deep-soul feelings that come with fighting for kids against these almost insurmountable odds, through the likes of The Treehorn Express is a feeling that bedevils expression. It’s just so satisfying. I’m really proud. To share the crusade on behalf of kids with a number of passionate true-blue professionals and to be able to keep it up with relish is a true blessing. It’s truly wonderful. Despite the fact that many old colleagues don’t care in the way that you thought they would, one can still remain hopeful. To see that the principals of the professional associations, in which one was heavily involved, lie dormant for want of expression, is disappointing. You hope that it is just because present circumstances have led to a change in the culture of membership and not a change in ideals. One can still remain hopeful. The occasional comment from some members of Australia’s more respected groups gives heart to the our Treehorn-type crusade for kids. When these groups eventually decide to exert the group synergy that tells the pompous testucators, politicians and business leaders to leave schools alone, Australia will be able to take its first steps in fifteen years towards a learning renaissance. Things are looking optimistic. We Treehorners have faith in the power of love-for-kids. Our children are forced by too many arrogant ne’er-do-wells to spend, during this present fortnight for instance, more school time using practising techniques to gain higher test scores – than to share in the development of music, art and human movement – those aspects of living that are of enormous importance for human well-being and personal interest. We didn’t have such pressure from outsiders to neglect these curriculum parts in earlier days. While we did it and hid it, but the poor buggers today are forced by superordinates to succumb to politically-sourced dysfunctional manipulations of the curriculum…well beyond normal tolerance. If our professional opinions were ignored then, our unions usually managed to stand-up for us, or our associations had something serious to say. Classroom teachers have no genuine champions these days. Children have only a few advocates. The teaching culture has altered significantly. Teachers are confused, compliant, neglected, frightened and meek. As the salt of the earth, these Kathleen Turners, deserve better. Knowing that one might be helping one or two of them to think clearer is extremely satisfying for those who love the Treehorns of this world….the ordinary, every-day kid. Neither did we, in the pre-managerial days, have politicians acting as puppets of the big-end-of-town, who would dare to tell us how to teach, nor use their pompous hubris to fiddle with the general curriculum to suit their own quack biases….Yes, you in particular, Chris Pyne. You do like to be in charge of little eichmanns, and be pompous in spreading confusion, don’t you? 2014 is not a good year to be a teacher. The world is due for change. 1. 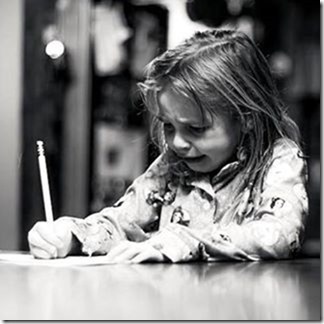 BUDGET MONDAY – the day before the NAPLAN devastation. Let’s hope that our all-knowing Treasurer can transfer the money wasted on counter-educative initiatives such as NAPLAN to positive educative enterprises….for the nation’s sake. NAPLAN costs would be better spent paying for aircraft repair over the years to come. Just get rid of NAPLAN, Joe, …..save heaps and heaps of money….and then …only after such invasive learning cancers disappear … watch school learning achievements grow. 2. THE AUSTRALIAN RESEARCH ALLIANCE FOR CHILDREN’S YOUTH (ARACY)+ CHILDREN’S HEALTH QUEENSLAND+ THE STATE LIBRARY OF QUEENSLAND + THE LOGAN CHILD FRIENDLY COMMUNITY CONSORTIUM from Logan City, south from Brisbane, are pleased to be hosting a symposium on children and young peoples’ well-being.. The Q’ld State Library, Southbank, Brisbane on Thursday, 19 June….9 a.m. to 3 p.m.
Should be lots of reliable NAPLAN info available. 3. TEACHERS. IF YOU MISSED SOME TREEHORNS DURING YOUR WELL-EARNED EASTER BREAK, TRY HERE…. Just click. Our oligarchy is better than yours. 4. No Queensland School Principal can receive The Treehorn Express any more. I have had to remove the addresses of about 40 recipients. Apologies to those who requested The Treehorn Express in the first place. Your emails kept coming back to me because “Your message was rejected by mxb.eq.edu.aufor the following reason: spam detected (0.20)” Sorry old buddies.throughout Q’ld. You just won’t get them. If someone sends this on to you, I’d be grateful, but please believe that there is nothing I can do about it. Those who gave me their private email addresses might like to contact friends and pass this message along. I’d like to think that it is a technical hitch, one that infests one special group amongst hundreds of others. 5 Prayer. Prayers. 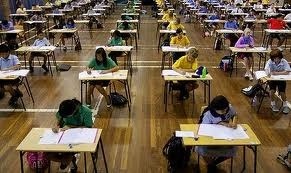 Prayers are the order of the day for the coldly distressed victims of cruel NAPLAN for the next 15 days or so. …..for those who believe that learning matters in every kind of political climate..
Kimberley College [http://kimberleycollege.org/ ] is an Independent Schools on the outskirts of Brisbane, Australia; established by a group of parents who firmly believed in the power of school based professionally ethical teaching/learning arrangements to develop their children’s potential and life chances to the highest degree. Since the original cohort of children enjoyed the multi-aged principles, together with de Bono-based principles of lateral learning while at nearby Kimberley Park State Primary School…. they lobbied unsuccessfully to have a state secondary school established in their own suburb that followed the positive attitudes to learning that their state primary school had confirmed. Failing in their efforts to persuade their state department to attempt an innovative approach to secondary schooling, especially the multi-aged component, the parents decided to establish a school of their own that respected children’s learning. Despite considerable harassment and negative official comment from some sections of the managerialist-based school authority of the time, it opened. This exceptional campus of learning is a reflection of the philosophy of its Principal educator, Paul Thomson …..as all schools reflect the attitudes to learning of their leader, whether educator or testucator. Also a general social justice proponent, he had, during this NAPLAN test crazed period, cause to telephone a Courier Mail journalist to suggest that his 22 March article “Why does the Left support this Avalanche of Paedophilic filth?” was excessive in his use of language in the below-the-belt reference to those not of the author’s own political persuasion. The reporter hung-up on Mr.Thomson. The Courier Mail belongs to Mr. Murdoch. Mr. Murdoch owns lots of things and people. 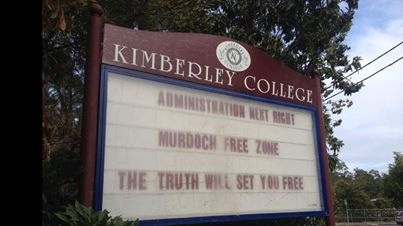 Unrelated to this incident, but about the same time, Kimberley College proudly displayed on its notice-board that it was a “Murdoch-free zone”. Thomson decided, having second thoughts, to alter the reference and changed the notice to a more inclusive “Bigot-free Zone”. The original lasted only one day. The change to “Bigot-free Zone” encompassed more of those people who have fixed prejudices, are utterly intolerant of those with contrary views and prefer social institutions to be run with an iron fist. In came the heavies, with the wrath of Rupert. Believe it ! The Queensland Minister for Education telephoned the school and ordered Mr.Thomson to remove the reference to our lord and master. Mr. Thomson agreed [he had already removed Rupert’s name] that the notice could be improved. ??? Hello?? Where did that come from? ???? What was the name of that planet, again? Where else in the world would you find a Minister of Education run defence for a pupil-frozen, money-focussed, test publisher, while a high stakes testing program, of which the publisher is the originator and controller, pollutes the curriculum and inhibits cognitive development within the Minister’s own schools? QED – quod erat demonstrandum. I linked to this article on Twitter and received a fairly terse response that we shouldn’t be differentiating for boys. What do you think? 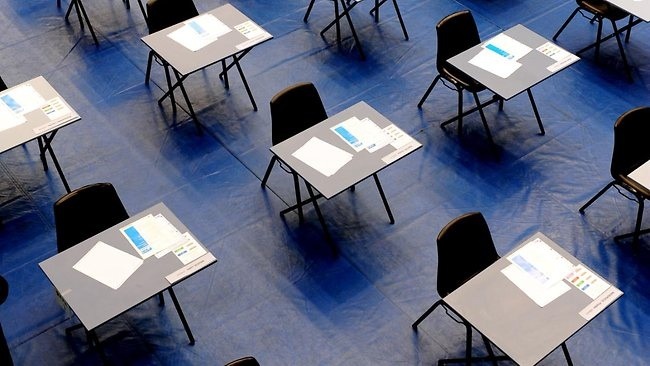 This article is from Australia and reveals an amazing coincidence – the rhetoric about non-performing teachers and way to sort this so-called problem is identical to that used in New Zealand, England, Canada and the USA. What are the odds on that? An article written about New Zealand and which is applicable all over. 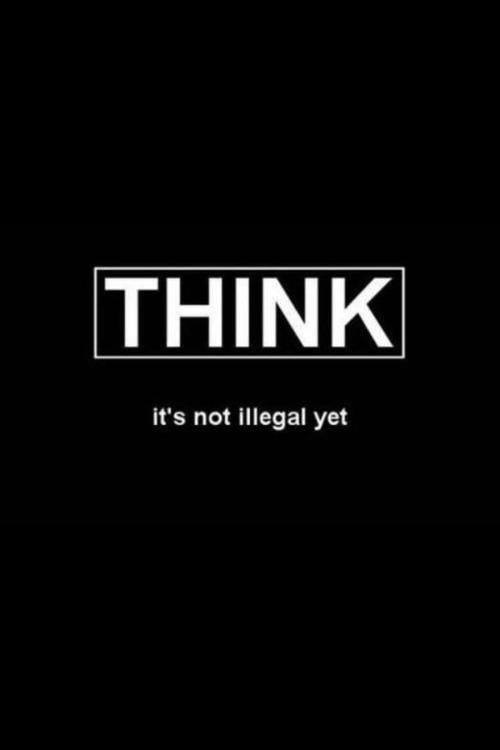 “So why is it that Governments persist with an ideology that is demonstrably flawed? A lengthy article by Peter Gray – recommended. An encouraging article from the UK, with no standards or tests in sight. Bruce’s latest article, looking back over lessons about learning gained from teachers and students he has worked with over the decades. 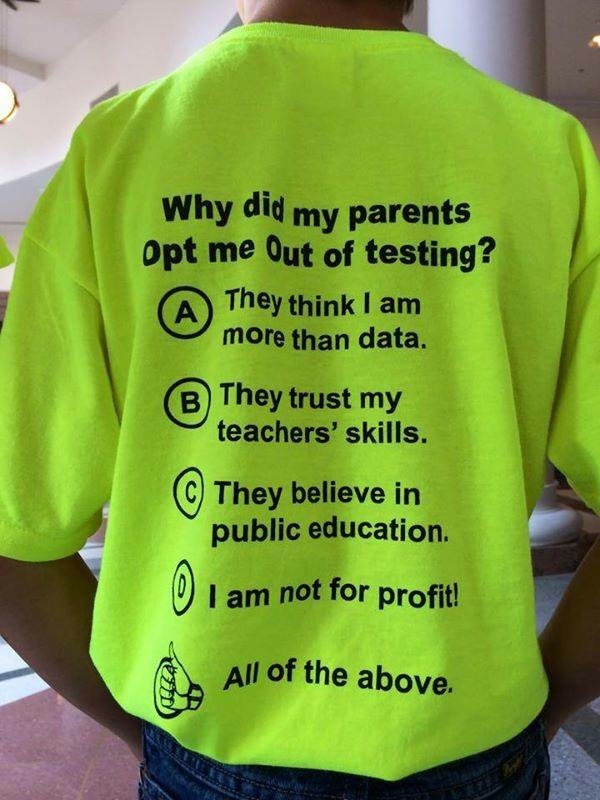 There must be a firm somewhere in Australia who likes children enough to reproduce these sort of t-shirts with its logo on it; and prepared to spread them as far as possible….so that the general public will start to wonder what is really going on in our schools? Most adults don’t really know and school authorities prefer to keep them in the mushroom dark. How about we send this email to as many as possible in the hope that some firm will take the initiative. It might not be possible to produce them before NAPLAN time : May 13,14,15 in Australia; but they will, eventually,encourage the general public to take a keener interest into what is happening in our schools. 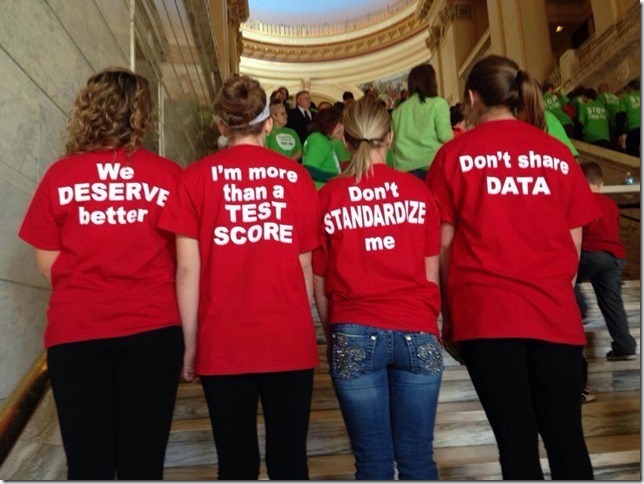 These shirts were a product of the OPT Out Oklahoma organisation. I imagine that a serious minded Australian firm, either involved in the education business or interested in helping school children would willingly produce similar t-shirts without breeching copy-right standards or piracy rules. Maybe schools can make their own. Why not? They’d be popular at the annual fete or sporting event. Please spread the idea. 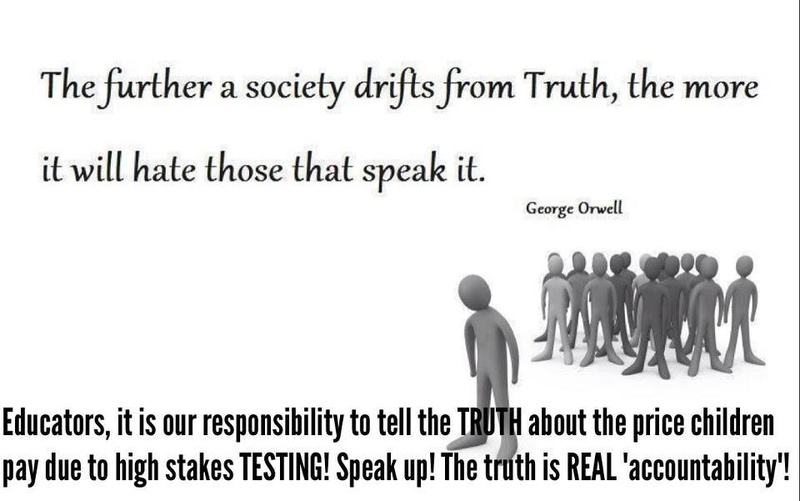 The public must learn more…somehow. We have to talk OUT LOUD. A. Do you believe that children are being treated with sincere humanity or just being used to gather scores? What’s your credo? B. Do you trust your child’s teacher to help him or her to learn without threats? Our public school teachers are truly outstanding. The world prefers them in their schools. C. We tend to follow the old British Grammar School traditions for our schooling. We don’t need to. It just happened; and public neighbourhood schooling has superior advantages. D. May the crutches of those who now use our school children for financial gain, become infested with the lice of a thousand camels and may their arms be too short to scratch. May all the above be attended-to as soon as possible. Don’t forget to do something. It is clear that Australia’s schooling system is under the control of the most effective oligarchy in the world. It’s a fact of life; and the managerialists’ coup of educational administration circa 1990 when learning in schools was out-sourced to management by lawyer smart-alecks and sycophantic politicians has made it so easy. The non-school big boys took over. Politicians of all colours and directions started marching to the beat of the big-business drum and continue to goose-step to its beat. We now live with it. Control of the school curriculum has moved almost completely to the rich and powerful corporations and their school-inexperienced operatives. The USA can challenge us as it has, but Australian adults are better at compliant subjugation to oligarchical control than anyone else on the planet, especially when it comes to matters of schooling. It might be alright for Australian adults to be so toady, but it shouldn’t happen when it effects the intellectual future of children and our country’s development. Australian citizens need to think more seriously about what they are doing, don’t they? A Princeton Study has put some science “behind the recently popular argument that the United States isn’t a democracy any more.’ The researchers, Martin Gilens and Benjamin J. Page have found that ‘…in fact, America is basically an oligarchy.’ The US oligarchy taught our Aussie big boys well, although the greatest mega-mogul of all, a former Australian, is well involved in the U.S, and quietly controls the oligarchies themselves in both countries. An oligarchy is a system where power is effectively wielded by a small number of individuals defined by their status. Members of the oligarchy are the rich, the well connected and the politically powerful, as well as particularly well place individuals in institutions like banking or finance or the military. “It’s beyond alarming” as Gilens and Page write. “The preferences of the average American appear to have only a miniscule, near-zero, statistically non-significant impact upon public policy. In other words, their statistics say ‘your opinion does not matter.’” summarises Tom Fry. While Australia has no replica study, our position at the front of the world queue of oligarchic political control, is unquestioned. Our history of the introduction of Klein Schooling makes this clear. Julia Gillard met with Rupert Murdoch and his fellow business moguls at a Carnegie Foundation cocktail party in New York on June 28, 2008. She was introduced to Joel Klein, a sweet-talking lawyer who controlled a school district that based its operations on almost-pure fear. [If the children did not pass the tests produced by Murdoch’s publishing company, Amplify, the teacher is sacked; then the principal; then the school is closed in disgrace.] She fell for his sweet-talk. Subsequently, with such influential decision makers in the right place, Rupert Murdoch’s control, supported by financial contributions, news biases and editorial opinions in Australia and in the U.S., was complete. He ensured that both countries followed the Klein line. Today, the opinion-making, lobbying and donating to political causes continues at full pace and its power is extensive . Rupert Murdoch employed Joel Klein in 2010 as executive director of News Corp to run his AMPLIFY company, a script and on-line testing business that had started as ARIS Data Management, then morphed into Wireless Generation, then Amplify. It’s worth billions per annum and Klein is paid in millions. He gets his way in all respects. Suitably conned, Julia Gillard invited Klein to come down under to help her to introduce his system. She arranged for him to meet with the leaders of our largest corporations and banks; and to speak at them during dinners held only in Sydney, Melbourne and Canberra. He’s an entertaining, convincing speaker. They, the Australian business leaders, paid the fare and expenses for Mr. & Mrs Klein; and his reception was vigorously applauded by the big-end of town. At the time, our present-day head-servant of the oligarchs, Christopher Pyne, insisted that Julia Gillard should resign for bringing such a person down under…but now endorses the Klein tradition of schooling with added venom. He’s added Charter IPSs for easier oligarchical control; and deliberately interferes with the professional curriculum operations as well as basic teaching techniques. So powerful was the influence of the big end of town on the introduction of Kleinism, that it was not seen necessary for Gillard to seek advice from educators. She consulted with some of them and told them what to do. Non-school-oriented academic testucators were preferred to run the system. Support from the various timid and compliant ‘professional’ associations was then easily arranged; and such is the level of power of the corporations that state and federal legislatures continue to ignore any advice that predominant representative groups have to offer. 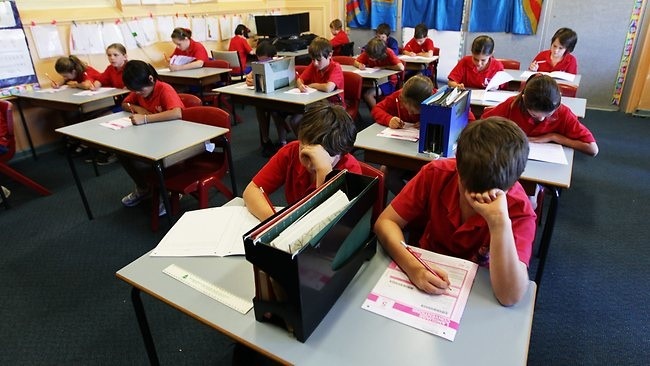 The dysfunctional NAPLAN scheme has been imposed on suffering children for six years now. A full primary school generation’s future has been tampered with. Meanwhile, Australia retains the title – the greatest oligarchical political control system the world has ever seen – and it shows. Capitulating to these forces too easily during the 2008-09s, we reversed the Anzac Spirit, that we honour this week. Control by a beneficent oligarchy would not be too destructive for children’s learning emotions, if basic democratic principles applied; and if they cared about kids or worried about Australia’s future. None of these three conditions apply, unfortunately. Our Klein system is based on pure greed and emotional force. There is no professionally ethical reason for NAPLAN’s existence and its modus operandi follows a more totalitarian fascist base than an open democratic one. In every schooling sense, it is a hideous item. Its domineering insistence on clandestine modes of administration reveals its evil intent more than anything else. Why hide the truth from parents? Not only that, but its bullying fascist-like lower-level modes of totalitarian control – blame, threats, bribery, fear, general coercion – only elicit the lower levels of acceptance by operatives in the field. The wholesome teaching-learning spirit declines. The magic of enthusiastic learning is taken out of the classroom. Standards decline. The system’s quality fades and, if it remains unchanged, becomes a laughing stock. 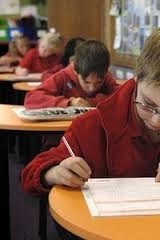 CLASSROOM TEACHERS TO INDICATE THAT THEY WANT NAPLAN BANNED COMPLETELY. Let’s test that Princeton statistic that ‘our opinion can be easily ignored.’. It’s the elephant in the classroom which can’t be ignored any longer and our children suffer for the next few weeks because of its presence. 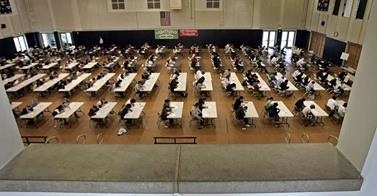 Photo: You can see some of the negative impact of all this high pressure/high stakes testing over at www.challengesuccess.org. I’m still unable to share any research showing a positive impact on children…although the folks who write/publish/sell textbooks/curriculums/tests probably benefit. For kids not for scores. Some exciting school days ahead, kids – coming soon to your school. Hey! Mum and Dad. Don’t forget to send your form supplied by www.literacyeducators.com.au to your school. New Zealand teachers have just reached the end of the 12 week first term of 2014 and are now looking forward to a two week break so they can rest and recuperate, not a holiday as non-teachers would have it. It’s intriguing how non-teachers make a big deal about all the so-called ‘holidays’ that teachers get, yet they are very quick to say that they could never be teachers. I hope that all teachers, everywhere, take the advantage of Easter to get right away from the pressures of their job and spend quality time on themselves and their families. An opinion post from Australia, however you will no doubt notice it is applicable all over. The Long Death of Creative Teaching: Common Core standards are part of a bigger movement towards stifling teachers. Does this ring any bells for you, wherever you are? Why many boys only do just enough. “Educational reform now largely equals intensive schooling: early-morning catch-up classes, after-school clubs, longer terms, shorter holidays, more testing, more homework. Time for a national conversation about education? Here’s another article from Bruce’s oldies but goodies file.